In this spiritual successor to his bestselling Saving Jesus from the Church, Robin Meyers shows how Christians can rescue their faith from abstract doctrines and rigid morals, instead discovering how God is already present in the joys and ambiguities of everyday life. People across the theological and political spectrum are struggling with what it means to say that they "believe" in God. For centuries, Christians have seen him as a deity who shows favor to some and dispenses punishment to others according to right belief and correct behavior (however defined). But this transactional approach to a God "up there"--famously depicted by Michelangelo on the ceiling of the Sistine Chapel--no longer works, if it ever did, leaving an increasing number of Christians upset, disappointed, and heading for the exits. In this groundbreaking, inspiring book, Meyers shows how readers can move from a theology of obedience to one of consequence, in which we stop seeing our actions as a means for pleasing a distant God and rediscover how God has empowered us to care for ourselves and the world. 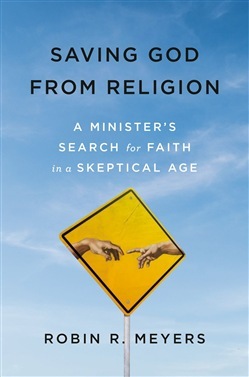 Drawing on stories from his decades of active ministry, Meyers captures how the struggles of ordinary people (like a child learning to pray or a mother coping with the death of her baby) hint at how we can approach faith as a radical act of trust in a God who is all around us, even in our doubts and the moments of life we fear the most. Acquista Falling Off the Ceiling in Epub: dopo aver letto l’ebook Falling Off the Ceiling di Robin Meyers ti invitiamo a lasciarci una Recensione qui sotto: sarà utile agli utenti che non abbiano ancora letto questo libro e che vogliano avere delle opinioni altrui. L’opinione su di un libro è molto soggettiva e per questo leggere eventuali recensioni negative non ci dovrà frenare dall’acquisto, anzi dovrà spingerci ad acquistare il libro in fretta per poter dire la nostra ed eventualmente smentire quanto commentato da altri, contribuendo ad arricchire più possibile i commenti e dare sempre più spunti di confronto al pubblico online.